Pakistan People’s Party (PPP) Co-chairperson Asif Ali Zardari said on Saturday that Chaudhry Aitzaz Ahsan was one of the oldest friends of the party and that he was their candidate for the office of President of Pakistan. He added that Maulana Fazl Ur Rehman was also a candidate for the same office but they had to see which candidate could represent the image of the country more positively and dynamically. Ahsan had come forward as attorney of Shaheed Mohtarma Benazir Bhutto when late President Ishaq Khan had implicated her in a fake case. He had then vowed that he would not allow Ishaq Khan to try Bhutto but would try him instead. This he said while addressing PPP Senators, MNAs and MPAs of Sindh at Chief Minister’s House on Saturday evening. The address was held in connection to Ahsan’s presidential campaign. Zardari said that PPP’s nomination of Ahsan would be remembered in history. He added that their friends should realise that his victory would be tantamount to the victory of all liberal forces. Zardari also said that Pakistan was facing serious challenges and hence the overall situation called for a practical manifestation of serenity and sanity. PPP Chairperson Bilawal Bhutto Zardari also spoke on the occasion. He urged the legislators to vote for Ahsan and said that every effort was being made to ensure the unity of the opposition on a single agenda. 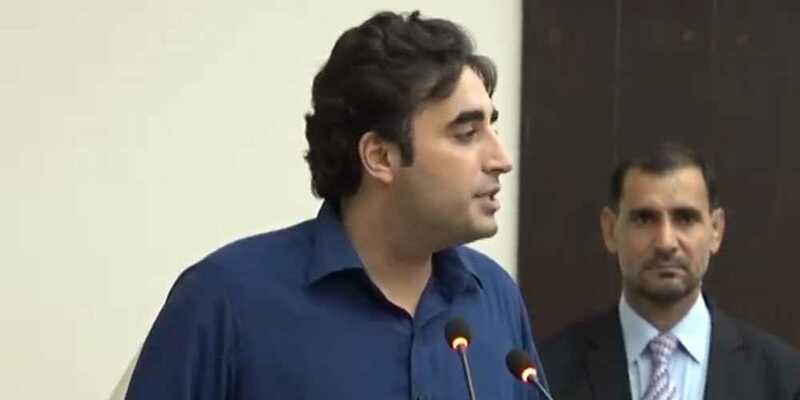 Bilawal said that the PPP would raise its voice over rigging in the general elections because political engineering and rigging would eventually cause the masses to lose their faith in the elections process. He said that when the opposition asked for a substitute in lieu of Ahsan for the office of President, they had offered no alternative. He added that there was no comparison of Ahsan with the candidate of Pakistan Tehreek-i-Insaf (PTI) for the same office of President of Pakistan. The PPP chairperson said that it was the blessing of the democracy that three consecutive elections had been conducted in the country and power was transferred. He stated that Asif Ali Zardari had been the country’s most powerful President and it was the PPP’s grand act to transfer the President’s special powers to the Parliament and the Prime Minister. Bilawal Bhutto Zardari said that the present government of PTI wanted to revoke the 18th constitutional amendment, which the PPP would oppose with full intensity. The presidential candidate Aitzaz Ahsan, Sindh Chief Minister Murad Ali, Shah Faryal Talpur, Khursheed Shah, Nisar Ahmed Khuhro, Qaim Ali Shah, Naveed Qamar and other party leaders were also present.